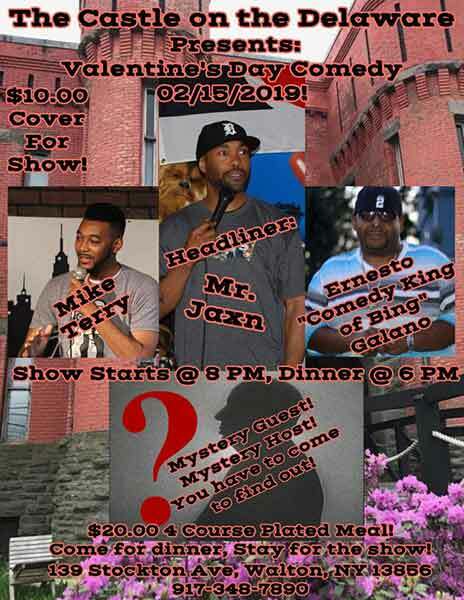 Castle on the Delaware presents to you the first Comedy Show and Dinner of the Year with 5 Hilariously funny Comedians on Friday February 15th 8pm to 11pm, $10 Cover Charge. Includes DJ Party Right after The Comedy Show. This will be a Clean Comedy Show with scaled back language. Come early for our delicious Valentine’s Day Dinner Menu and stay for the Show. For smaller appetites choose individual items from our menu or choose the advantageous 4 Course Prix fixe Menu. Reservations Recommended. The deadline to purchase tickets online for the Valentine’s Day Comedy Show on Fri, Feb 15th, 2019 has passed. Tickets may still be purchased at the door for $10 each, space permitting.